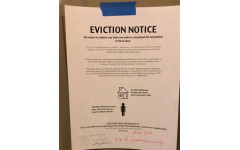 This past week, some students at Emory University found mock eviction notices on their doors. 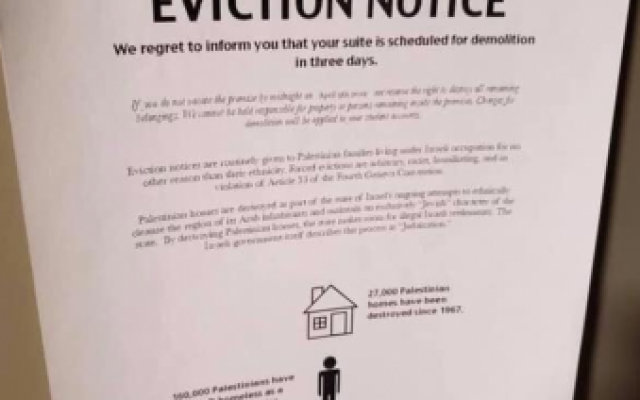 Distributed by Students for Justice in Palestine (SJP), this wasn’t the first time college chapters of the group have tried to raise awareness about evictions in Israel in this manner. In 2013, hundreds of students at Rutgers received similar flyers that also invited them to visit the group’s Facebook page to learn more. That group was careful not to target Jewish students only; the uproar then was that they violated university rules in slipping them under dorm doors. 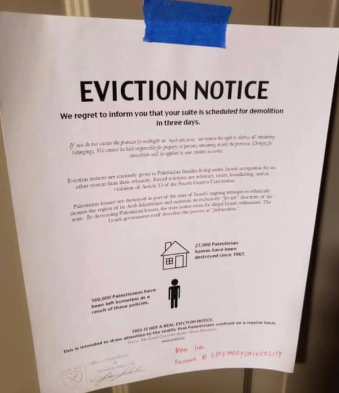 The following year, 2000 students at New York University received mock eviction notices too, although in this case a dorm with a high percentage of Jewish students (and even a Shabbat elevator) was one of the recipients, and no invitation to learn more or have a discussion was included. 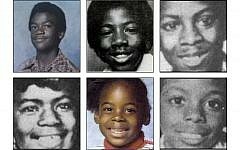 Students felt targeted. These three are not isolated; other schools’ chapters of SJP have similarly distributed “eviction notices.” There is even a site to guide students on how to legally hand out flyers; it is accompanied by a “mock eviction checklist” which advises pro-Palestinians groups on what content to include, what to do before and during the action, what potential backlash they may face and what to consider in their media strategy. The flyers at Emory used the same numbers as the flyer distributed at NYU five years ago; it was not a product of research. Nor did it invite anyone to discuss or learn more as did Rutgers’. Encouraging honest discussions about evictions is something that ought to be done, but unilaterally and without substantiation calling evictions “ethnic cleansing” does not do that at all. It is misleading and counterproductive. 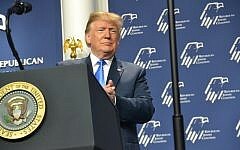 The uproar in Atlanta was focused both on the fact that while prior permission to distribute was given by the school, the flyers were also placed in unapproved areas and on the community uproar that it was an anti-Semitic act. But was it? Given today’s climate of rising anti-Semitic acts and anti-Zionistic anti-Semitism, it can be too easy to fall back on this reaction, but it is one that ought to be only use when warranted. None of this isn’t to say that evictions aren’t a real issue that merits attention. This past January Israel’s Supreme Court refused to rehear a patently unfair case about a Palestinian family being forced to leave its home in East Jerusalem; Palestinians do not have the same right as Jews to reclaim property abandoned during the 1948 war of Independence. Another court ruling at the tail end of 2018 allowed 700 Palestinians to be evicted in order to transfer their homes to settlers. In other parts of the country, entire villages have been evicted and demolished. Recently, one group of Bedouin women photographed their village in the Negev to document the home they are being made to leave; the photos and accompanying text are part of a book published by the Coexistence Forum in Hebrew, Arabic and English and the sadness the photos evokes is real. 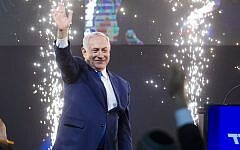 Discussing Israel’s flaws is not anti-Semitic. 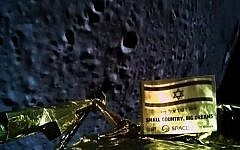 As with the boy who cried wolf, knee-jerk reactions of calling criticism anti-Semitic runs the risk of losing credibility when real cries of bias should be heard. The problem with both how Emory’s SJP and those that called the flyers anti-Semitic have handled the situation is that neither approach actually offers an opening for real conversations about real issues. And even worse, the situation has since escalated with accusations and counter-accusations; Pro-Palestinians students are now calling for the university community to boycott Jewish campus organizations. What this situation does serve as is an example of what the climate on college campuses is like for many Jewish students. This month, flyers distributed at Columbia University in New York in conjunction with Israel Apartheid Week depicted an Israeli soldier with horns on his head, a professor at the same school compared Israel to ISIS on his Facebook page and last month a visiting professor told students that Israel experiments on Palestinian children with new weapons systems. As we enter into the season of parents of high school juniors visiting colleges to consider which to apply to, it is more and more important to make informed decisions. And given how reactions in social media to real or perceived slights often take on a life of their own, it is important to be able to make informed decisions. But this is not always easy to do. 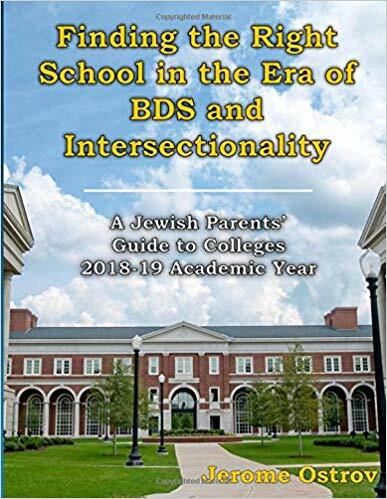 Retired attorney and college counselor Jerry Ostrov decided to do something about that and has written Finding the Right School in the Era of BDS and Intersectionality: A Jewish Parents’ Guide to Colleges 2018-19 Academic Year. 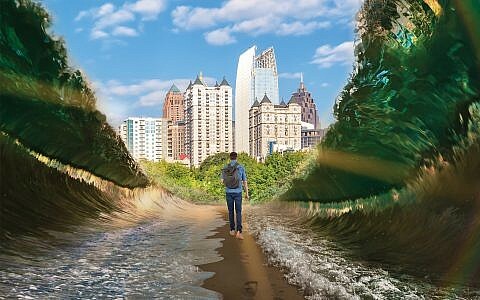 He explains in a balanced – and not knee jerk – way what the issues are so that parents and students can make informed decisions. Atlanta-based Diane Fisher of College is Next helps parents and students with the college admissions process and can see the book’s value. “I believe it is a well-researched guide to colleges with specific content relevant to Jewish college goers,” she notes.